The digital era of the 21st century, offices and all printing companies need efficiency when it comes to printing their documents. Thus it is advisable that a good choice is made when purchasing of any printing device. Printers vary when it comes to warming time; that is the time between when the printer is switched on through the time it is ready to print. Though printing speed and quality may be excellent, a slow printer warm-up time may be too annoying to deal with. These three earned notoriety for being the slowest. If you are unlucky enough to have bought one, time to reconsider a new investment. The answer has to do with how printers operate. 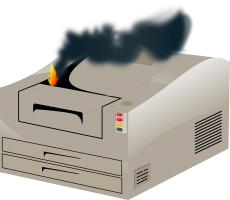 Slow warming printers are typically the result of the fuser taking its time to heat to manufacturers temperature requirements. The fuser is used to melt carbon powder onto the printing paper; also explaining the reason why fresh copies come out of the printer feeling warm to the touch. Fusers that take a while to warm up indicate that it is wearing out. Sunrise Office Systems recommends that fusers be checked regularly for faulty operation. Further, if it’s power source is delivering low power, it significantly delays a fuser’s warm-up time. On a printer, the electronic display might takes a while to appear before you can begin to press commands. This is caused by the time taken by the printer to make a static charge on the printing paper and the data to be printed. When the charge is made on the printing paper, the toner propels onto to the paper. 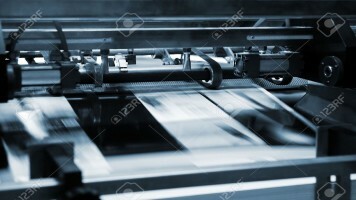 Slow heating of the fuser slows the melting of toner thus delaying electronic display. Weak wireless connections for printers may delay the response time. Wrong router configuration settings or poor internet connection affects the consistency of data sent to the printer and therefore a delay or error occur during the response. A strong internet connection is required in order for a wireless printer to operate effectively. When it comes to printing, speed is essential. A good printer should be reliable enough to print quality documents at a faster speeds. Different printers have varying warm up time, but a printer with faster warm up time is the best for your business to continue running smoothly. If you’ve encountered problems with a slow printer, let our technicians help you determine if it’s an easy fix or time for a new machine. For small businesses like law practices, medical offices and car dealerships, it’s critical to keep a watchful eye on the bottom line. Sometimes that means finding the best deals possible on essential office equipment like copy machines, which usually leads them to purchase refurbished goods. Typically, it’s a smart move. But as some unhappy businesspeople have found, buying refurbished Toshiba copy machines for the seemingly reasonable price of $1,000 – regardless of whether they print in color or black-and-white – has resulted in more headaches than savings. The numerous problems that businesses are experiencing with these Toshiba copiers has kept those in the copy repair business quite busy these days. The chief reason for the spike in service calls is that Toshiba provides no support to those who have purchased these refurbished copiers, and that has left many businesses looking for a lifeline so they may continue to have the use of their copier, an essential tool for their operations. What steps are involved in refurbishing a copy machine? The owners at Sunrise spend their free time refurbishing machines themselves. The process usually involves a rigorous quality check that includes a full inspection and an evaluation for possible performance problems. Both the interior and the exterior of the copiers must be cleaned, and following a thorough inspection of everything from rollers and bearings to drums and belts, technicians replace any parts that are no longer working properly. From there, the features and functions of the machine are tested to make sure it is performing as it should. We believe no machine should be put up for sale until all issues are addressed and the machine passes inspection. A quick search for prices on refurbished copy machines clearly demonstrates why so many of these un-furbished Toshiba copiers have found their way into so many offices. Simply put, the $1,000 asking price for the reconditioned models is a fair amount less than what someone might pay if they purchased a used machine from another vendor. For example, a basic refurbished Toshiba e-Studio 230 or 280 sells for $1,395 at ctcopier.com, and that’s for a machine that produces back and white copies only. Compare this cost to the $1,000 deals offered through Toshiba on either color or black-and-white machines, not to mention the minimum $2,599 price tag on a brand new Toshiba e-Studio 477 SL black and white copy machine, and you can see why Toshiba’s reconditioned copiers are a popular choice for those looking to keep costs down. Luckily, the issues that have continuously plagued those who purchased the refurbished Toshiba copiers are rare. In most cases buying a used machine can save a business as much as 85 percent, according to an articles posted at professional networking sites including linkedin.com, and those kinds of savings mean a lot to a small or medium-sized business, especially in this economy. If you are confident about the manufacturer that is offering refurbished copiers for sale, then most likely, you will be bale to buy a used machine that can provide your business with all the functionality for a fantastic value. Onvery rare occasion, paper jams cause fire. It happens to all of us: paper jams. When you patiently await your print-out only to find an accordion 8×11 wedged between the innards of your office printer. It is extremely common for printers to experience paper jams. Before calling for repair, there are a couple things you can do to fix the paper jam yourself. First, make sure you’ve put the proper size paper into its corresponding tray. Copy machines have sensors that will disable print jobs if the wrong size of printer paper is detected. Second, avoid using thick card stock ,and stick with standard xerox copy printer paper. Similarly, those sensors may disable the print job if does not recognize the type of printer paper inserted in its tray. Third, locate where the jam occured. Check the paper tray. Check the rollers. The rollers are the part of the machine that grip the paper and funnel it through the machine. Roller malfunction is extremely common. You can loosen stiff or stuck rollers with WD 40. Fourth, try making a copy. This sometimes pushes through jammed print-outs. Remove all bits of paper that may have shredded or torn during the jam that you can safely reach. If that doesn’t work, try pulling the paper through carefully. Jerky motion can damage the roller and ink cartridge, and lodge the paper jam deeper into the machine. IF that happens, it’s time to call a repair man. At this point, you’ll risk breaking down the copy machine altogether, and damage your clothes from the ink or burn yourself on overheating parts. Congratulations! You’ve made the decision to brave the world and take on the weighty challenge of entrepreneurship. You’ve got the million dollar idea, enough capital to get you started, and the persistence of a rogue freight train. As you sit in front of your blossoming business plan, you start to wonder about how best to spend the money that needs to get you as far as possible. Where do you make your initial investments with a finite set of funds? Here are the basics you’ll need to get started to take your business to the moon, first class. A classic mainstay of any office, the copy machine is a necessity for small businesses of almost every sort. You’ll be needing to copy customer invoices, marketing materials, and other important documents throughout your early days. Make sure you invest in something that won’t break easily, and get a copy machine with a warranty or service contract as well for any pesky problems you might encounter along the way. In the critical hours of the beginning of your business, you’ll want to ensure your up-time for all your equipment is as high as possible. Beyond just a copier though, printer and toner is another expense you’ll absolutely have to account for in your business plan. Today, most printers can serve more than just the printing function; investing in a nice office printer will likely allow you and your employees to scan documents as well. A local printer/scanner combination can serve an entire office of employees, but depending on how many people will be working together, it might be a good idea to invest in more than one. Ideally, you’d like to buy one printer for every five employees you have, but you could stretch this to ten in the beginning if funds are tight. Depending on what business is, there are a range of computer options available for every possible need and want. At the most basic level, you’ll at least need a desktop computer to get you up and running for simple things like email, customer tracking, and basic finances. But what if you want or need more than that? You could invest in a laptop or tablets for traveling or portability between home and office. If your employees don’t have smartphones, you might have to invest in those as well depending on their job duties. Additionally, you’ll want to tack on an amount for software as well. At the most basic level, you should expect to install Microsoft Office Suite, or an equivalent package from another software developer. Depending on your needs and what your business entails, software could even be one of the most expensive early purchases you make, so understand clearly what your requirements are and plan accordingly. Now that you have a computer, the last thing you’d want is for all of your data to be lost. Investing a couple hundred dollars in a backup solution is the smart thing to do to prevent misery and chaos in the aftermath of a hard drive failure. While a hard drive is the simpler, cheaper choice to keep you in business, spending more money on a Network Attached Storage (NAS) might be worth it depending on your circumstances. A NAS consists of one or more hard drives and allows you and your employees to access the drive via a shared storage through an Ethernet connection. If you aren’t a one-man-show and all of your employees are using computers daily, this is probably a better option than buying everyone individual hard drives. This might be construed as a joke, but you’d be surprised. Caffeine has been known to single-handedly be responsible for some startups ultimately becoming successful instead of meeting an untimely, early doom. If you want to stay in the office longer, keep your employees from having to take frequent breaks to get get a cappuccino, and be more productive during long, slogging hours, it’s to your benefit to invest a few bucks into a machine that can up your productivity and keep you feeling good. Seriously, this stuff powered the industrial revolution; before coffee, a lot of people drank beer for breakfast! If it’s good enough to have shifted the world into overdrive three hundred years ago, it’s still good enough for you and your band of trusty startup rockstars. Hopefully you have a basic understanding of the different equipment you’ll need to invest in immediately to get your start-up business off the ground. You’ll want to factor in the other necessities required by your particular business plan as well, but make sure you spend your money as efficiently as possible. And do your research – sometimes, it’s better to spend more money for a quality product if you’ll be using it more frequently, and sometimes you won’t be getting the value you need by spending a lot more. In fact, if you’re based in Las Vegas, seriously consider a service contract with our copy machine maintenance and repair company, Sunrise Office Systems. Ensuring that your machines are fully-operational 100% of the time also ensures that you can keep office processes running smoothly. By being diligent, doing your homework, and investing in the right equipment, your business will be that much more likely to succeed.